In the immediate aftermath of World War II, France worked to rebuild its military. Much progress had been made in aviation during the war years, and this was now an area of special focus. The French Navy (Marine Nationale) expressed an interest in a new aircraft that could serve in fighter, interceptor, and ground attack roles. Although other navies were beginning the transition to jet aircraft, the French Navy requested this new aircraft to be piston-powered. Side view of what is believed to be the first Sud-Ouest SO.8000 Narval, which was actually the second aircraft to fly. This image illustrates the good visibility provided to the pilot by the cockpit’s configuration. Note the radio antenna mast under the cockpit that was unique to the first aircraft.The aircraft is also lacking gear doors. 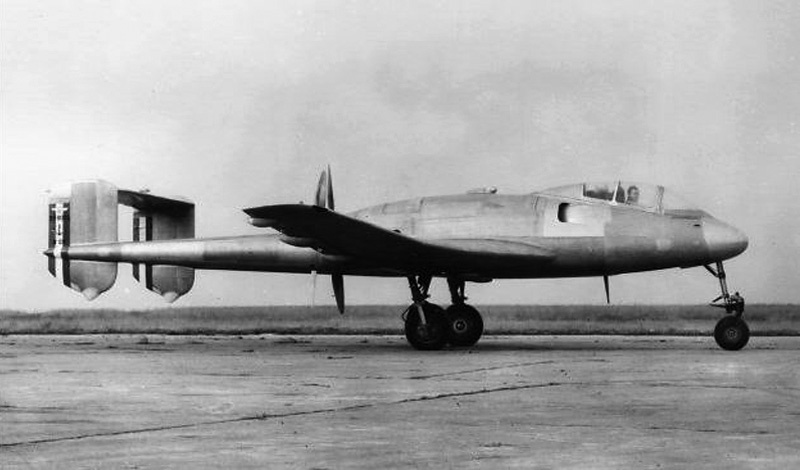 On 31 May 1946, the Société nationale des constructions aéronautiques du sud-ouest (often abbreviated as SNCASO or shortened to Sud-Ouest) was selected to design this new aircraft and build two prototypes. Arsenal de l’Aéronautique (Arsenal) was selected to develop its power plant. The original plan was to build five prototype aircraft followed by 65 production aircraft. Sud-Ouest moved quickly and designed an unusual single-engine pusher aircraft with twin booms supporting its tail. The aircraft was designated SO.8000 and given the name Narval (Narwhal). 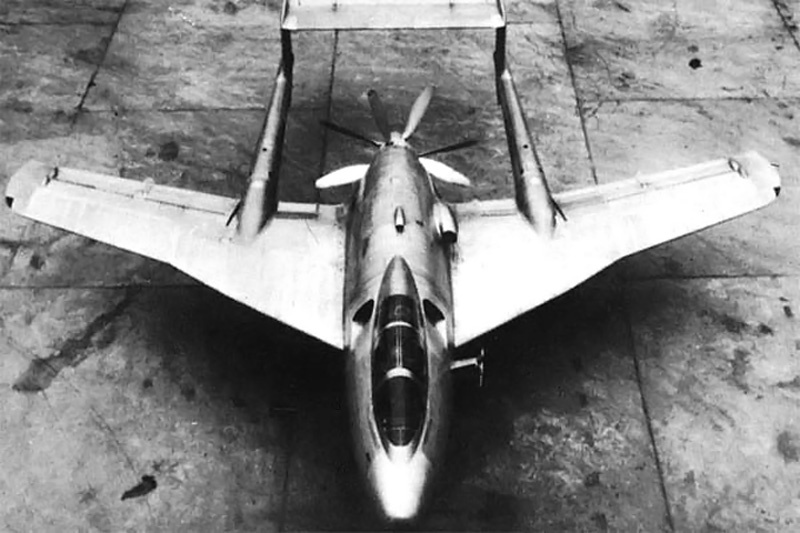 Designed by Jean Dupuy, the SO.8000 was an all-metal aircraft. The inboard leading edge of its wing was sweptback 24 degrees, while the outboard section was sweptback 13.5 degrees and incorporated a dihedral angle. The aircraft had large double slotted flaps to decrease its landing speed for carrier operations. Roll control was achieved by a combination of small ailerons at the wingtips and spoilers. 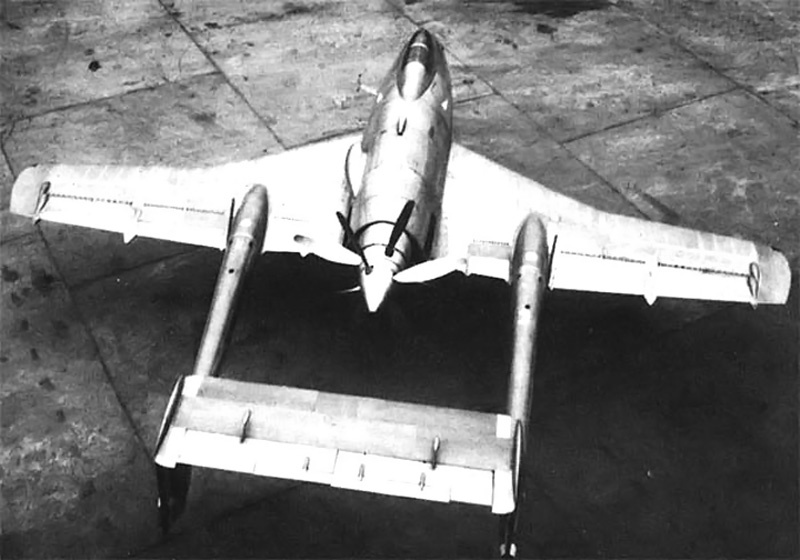 The twin booms extended from the inner wing sections and each supported a fin extending above and below the boom. The horizontal stabilizer spanned between the two tails and was attached near their top. On the second aircraft, which was the first to fly, the elevator was extended beyond the vertical tail fins and incorporated a horn balance. The first SO.8000 had its pitot tube located on an outrigger by the cockpit and not in the wing leading edge like the second aircraft. This view shows the Narval’s air inlets for its radiator and the air intake for its engine. The pilot was enclosed in a sliding bubble-style canopy near the front of the aircraft. This configuration provided the pilot with an excellent view. Behind the cockpit and on each side of the aircraft were cooling air intakes for the radiator. After flowing through the radiator, the cooling air exited around the spinner of the eight-blade contra-rotating propellers. The air intake for the Arsenal 12H engine was located on the upper left side of the rear fuselage. Lacking the time to design and test a completely new engine, Arsenal turned to the German Junkers Jumo 213A as a starting point. Arsenal reworked the Jumo 213 and created the 2,100 hp (1,566 kW) 12H. The 12H was an inverted V-12 with a 5.9 in (150 mm) bore, a 6.5 in (165 mm) stroke, and a displacement of 2,135 cu in (35.0 L). However, more power was desired, and Arsenal increased the 12H’s output to 2,250 hp (1,678 kW). This power increase caused some engine reliability problems. In 1948, the aircraft engine branch of Arsenal was absorbed by the Société nationale d’études et de construction de moteurs d’aviation (SNECMA), and the engine became the SNECMA Arsenal 12H. Another view of the first Narval illustrating its wing sweep and contra-rotating propellers. The SO.8000 Narval was to be equipped with six 20 mm cannons in its nose. Additionally, underwing hard points would accommodate 2,205 lb (1,000 kg) of bombs. However, it is unlikely that the prototypes were ever armed. The SO.8000 had a 38 ft 7 in (11.75 m) wingspan and was 38 ft 9 in (11.80 m) long. On its tricycle landing gear, the aircraft stood 10 ft 6 in (3.20 m) tall. The Narval had an empty weight of 10,626 lb (4,820 kg) and a loaded weight of 15,432 lb (7,000 kg). The predicted performance of the SO.8000 was a maximum speed of 453 mph (730 km/h) at 24,606 ft (7,500 m) and a landing speed of 96 mph (155 km/h). The aircraft had an estimated 2,796 mi (4,500 km) range at 329 mph (530 km/h). This image provides a good view of the first SO.8000’s elevator. Note how the horizontal stabilizer does not extend beyond the tail fins. Most sources indicate that the second prototype (registered as F-WFKV) was completed and flew first, taking to the air on 1 April 1949 with Jaques Guignard at the controls. The first prototype’s first flight was on 30 December 1949 with Roger Carpentier (some sources say Jaques Guignard) as the pilot. The SO.8000 experienced numerous problems during its flight test program. The aircraft handled poorly and possessed some undesirable control characteristics, such as instability at low speed. Efforts were made to improve control and performance, including replacing the Chauvière contra-rotating propellers with a Rotol unit, but the results were still not satisfactory. In addition, the 12H engine proved to be unreliable. The flight tests revealed that the aircraft would not achieve its expected performance, and flight evaluations of the SO.8000 at the Centre d’Essais en Vol (Flight Test Center) in January 1950 were mostly unfavorable. Given the trouble with the aircraft and the dominating performance of jet aircraft, further development of the SO.8000 was halted. A contributing factor in the Narval’s cancellation was the allocation of US Grumman F6F Hellcats and Vought F4U Corsairs to France. The second prototype took its 43rd and final flight on 8 January 1950. The first prototype was only flown twice. Proposals were submitted to convert the aircraft to jet-power as the SO.8010, but no further action was taken. Apparently, both SO.8000 aircraft were scrapped after the program was terminated. In contrast to the image above, the elevator of the second SO.8000, which was actually the first to fly, can be seen extending past the tail fin in this view. The radio mast for the second aircraft was located on the back of the aircraft behind the cockpit, and note the pitot tube is on the far wing. In this image, the nose gear door has been attached but the main gear doors have not. This entry was posted in Aircraft, Post World War II on 25 January 2014 by William Pearce. 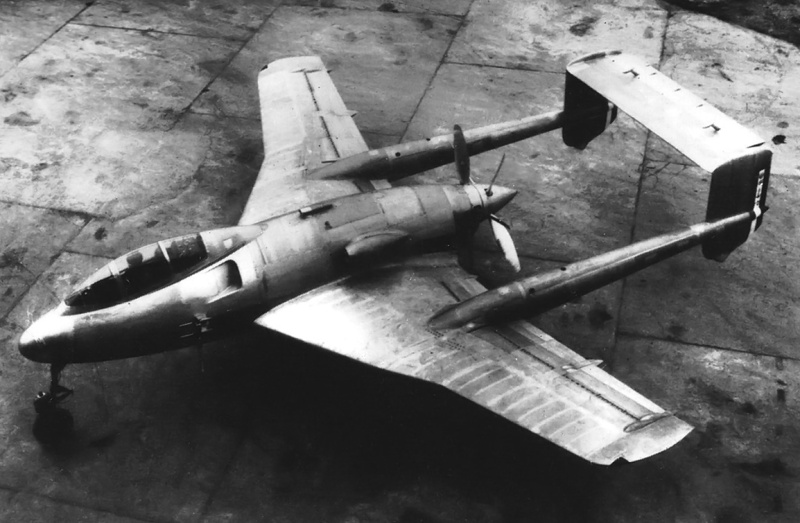 A very unusual layout – there couldn’t have been too many post-WW2 pusher engined aircraft. A question…. How can such plane land on a carrier? ’cause for what i can see, there’s no arresting hook? Maybe reversing the pitch on the propellers? Arresting net? Or the project was ended before even try a carrier landing? P.s. Sorry for poor grammar, I’m not an english speaker. Good questions. The SO.8000 project was cancelled before any carrier trials were attempted. As best as I can tell, the prototypes never had any arresting gear installed. I have not found anything that indicates how the arresting gear would have been installed on the aircraft, and I think there would have been issues with landing the aircraft on carriers. Maybe more info will be found someday. Thank you Sir for your accurate reply! even considering a stopping device? to the main fusellage at an angle raising the end tail and the rudders. But that just building castle in the air. I agree. Sitting here 70 years later, I think the tails are too low for an aircraft that would inevitably hit hard on a carrier deck. But, that same issue should have been apparent to the designers. Maybe they had a solution that was never implemented because of the SO.8000’s very short life.